Vice President, Prime Minister, Defense Minister of the UAE, ruler of the Emirate of Dubai Sheikh Mohammed Bin Rashid Al Maktoum has confirmed that the UAE supports the sovereignty and territorial integrity of Ukraine within its internationally recognized borders. 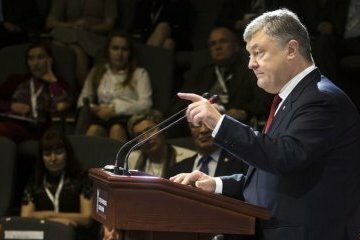 Ukrainian President Petro Poroshenko has said he hopes the agreement on visa-free travel with the United Arab Emirates (UAE) will come into force in December, the press service of the head of state has reported. 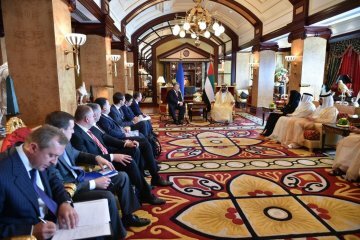 President of Ukraine Petro Poroshenko held a meeting with President of Belarus Alexander Lukashenko in the United Arab Emirates, the Ukrainian president’s press service reports. 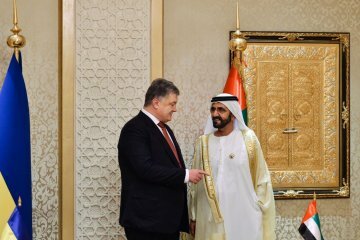 Following the talks between President of Ukraine Petro Poroshenko and Prime Minister of the United Arab Emirates, ruler of the Emirate of Dubai Sheikh Mohammed Bin Rashid Al Maktoum, a visa-free regime between the two states was agreed. 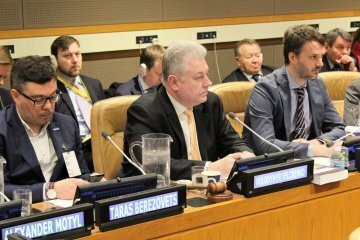 The draft updated resolution "Situation of human rights in the Autonomous Republic of Crimea and the city of Sevastopol (Ukraine)" contains a number of new requirements for the Russian Federation as well as an appeal to the UN Secretary-General on the coordination of actions of UN bodies in Crimea. 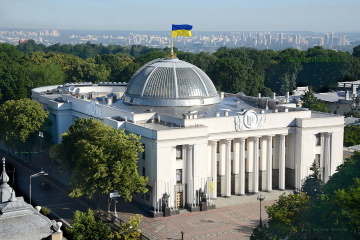 A draft law on the president of Ukraine and the procedure for termination of his powers has been registered in the Verkhovna Rada. 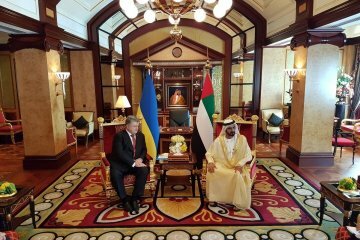 President of Ukraine Petro Poroshenko has arrived in the United Arab Emirates on a working visit, where he will discuss with the leadership of the state a bilateral cooperation in the political, investment and security fields. Ukraine and Saudi Arabia have agreed on visa facilitation and the procedure of Hajj (pilgrimage) to holy cities of Islam in the Kingdom of Saudi Arabia. 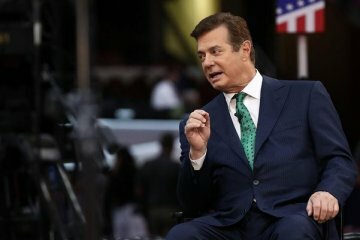 The Ukrainian government is prepared to open its files to U.S. authorities investigating President Donald Trump's recently indicted former campaign manager, Ukrainian Prime Minister Volodymyr Groysman has said. The North Atlantic Alliance has plans in the event of the escalation of Russian military aggression against Ukraine, but is not obliged to defend the state. 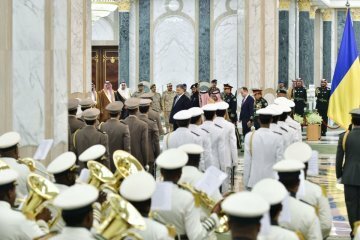 President of Ukraine Petro Poroshenko and King of Saudi Arabia Salman bin Abdulaziz Al Saud agreed during the meeting to intensify bilateral cooperation in the political, trade and economic, military and technical, energy and investment fields. 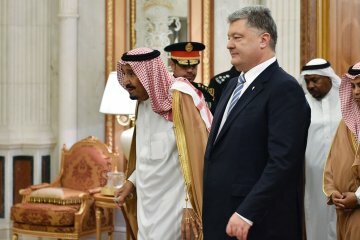 President of Ukraine Petro Poroshenko meets with King of Saudi Arabia Salman bin Abdulaziz Al Saud. 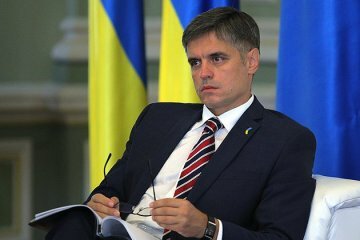 The Polish Foreign Ministry condemns the purchase and supply of anthracite coal from the occupied territories of Ukraine to Poland. 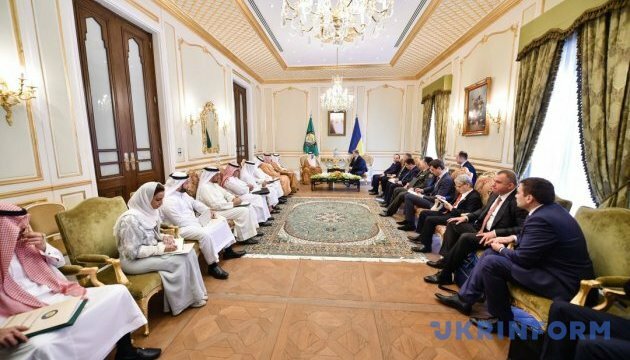 President of Ukraine Petro Poroshenko has called on the Cooperation Council for the Arab States of the Gulf to protect the rights of the Crimean Tatars. 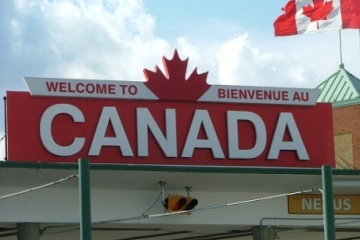 The Canadian opposition promises to urge the Government to abolish visa requirements for travel of Ukrainian citizens to Canada.